I've written about cycling helmets and safety a couple of times before. See 'Using, not losing, your head', and 'Lies, damned lies, and cycle helmets'. But more often, as you know, I write about things which relate to public policy in Scotland. Now, sadly, I'm having to combine the two topics. In brief, in August 2011 a driver named Gary McCourt mowed down a 75 year old cyclist, Audrey Fyfe, on the Portabello Road in Edinburgh. She was killed. Nor was this the first time that McCourt had mown down and killed a cyclist; in 1985 he had been jailed for killing 22 year old George Dalgity. McCourt stood trial this month for the death of Audrey Fyfe. He was sentenced to 300 hours of community service, and banned from driving for five years. In passing this remarkably lenient sentence, Sheriff James Scott commented that Audrey Fyfe "...was not wearing a safety helmet and that in my view contributed to her death." 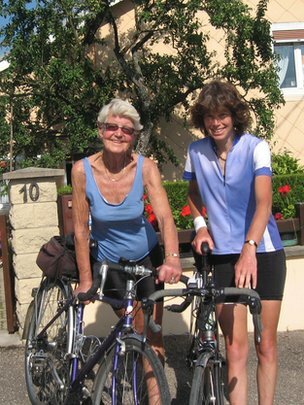 Audrey was a very experienced cyclist, and like most experienced cyclists of her generation, she did not choose to wear a cycling helmet. As I've evidenced in the two posts I've referenced above, the evidence such as it is supports her in that choice: there is no conclusive evidence either that helmets significantly decrease the risk of injury to cyclists, or that they significantly increase it. There is a small correlation between increased rates of helmet wearing and increased (yes, you read that right, not decreased) rates of injury, but that's probably because the same fear factor which drives people to wear helmets also deters them from cycling at all, and we lose the 'safety in numbers' effect, rather than helmets actually killing people. I'm not personally greatly in favour of custodial sentences, for any crime. But I do think that it should be automatic when a motorist causes injury or death to a pedestrian or cyclist, that they should be given at minimum a suspended life sentence, and, as a condition of its suspension, a lifetime driving ban. That way, they do not serve any prison time unless they are caught driving a motor vehicle again, but they know that, ever after, if they are found driving a motor vehicle, they will go to prison without the need for any further trial. If McCourt had been given a sentence of this kind on killing George Dalgity, he would not have killed Audrey Fyfe. As a matter of public policy, it is important to decrease the amount of car use in our cities, and to switch journeys from modes of transport which consume a great deal of energy and of public resources such as road space to those that do not. Further, there is a public policy interest in improving the general health and fitness of the population. Encouraging cycling fulfils both these aims. The main deterrent to increased cycling is the threat to cyclists from irresponsible and inattentive drivers. In the light of this, the decision of Sheriff James Scott to impose a non-custodial sentence as penalty for Gary McCourt's second killing of a cyclist is against the public interest and should not be allowed to stand. It is particularly notable that Scott cited Mrs Fyfe's lack of a helmet as a reason in his unduly lenient judgement. There is no evidence whatever that cycling helmets offer any protection in collisions with motor vehicles, and those who manufacture and sell helmets do not pretend that there is. They are designed to mitigate simple falls at low speed, and nothing more. The sheriff was therefore ill-informed, wrong and and prejudiced in his judgement. More importantly though, this fact had no bearing on the matter before him, namely the criminality of McCourt's driving. Hence he had no legal basis for referring to it when explaining his sentencing decision. Given McCourt's previous conviction I feel that a much stronger sentence should be applied, with at least a lifetime driving ban imposed. I urge you to appeal this unduly lenient sentence. May I encourage you to write one also?